Universal mounting brackets for easy installation anywhere. 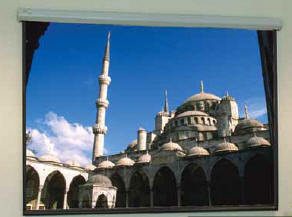 Available in AV, NTSC/PAL, HDTV and WideScreen format. Steel case which has a scratch-resistant white polyester finish with matching endcaps. • Baronet: Screen (bottom photo) with 3m power cord and in-line switch. 110V or 220V motor available. • Baronet/HW(top photo): Furnished with junction box and 3-position wall switch for recessed wall mounting. Available with 110V or 220V motor. • Baronet/CE: Furnished with terminal strip and white 3-position "European" style wall switch for surface mounting. 220V motor only. With control options, the Baronet/HW or Baronet/CE can be operated from any remote location. Depending on surface, available in sizes through 244cm x 244cm or 96" x 96"
These projection screens warranted for one year against defects in materials and workmanship. 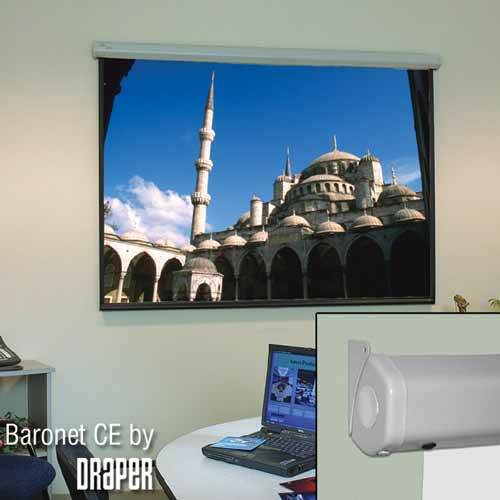 The Baronet offers an excellent, lower-cost alternative to hardwired motorized screens. No electrician is required with the Baronet. Just install the motorized screen and plug it in. It’s that simple. Its 10ft power cord plugs into the nearest wall outlet. The Baronet is controlled by a 3-position, inline operating switch. Its attractive case fits in most spaces. Case measures only 3¼” high x 3¼” deep and still houses the quiet, trouble-free motor. Endcaps form universal mounting brackets making installation easy whether it is mounted on a wall, suspended or recessed above the ceiling. Both brackets extend ½” above the case. The Baronet’s pentagonal-shaped steel case has a scratch-resistant white polyester finish.